I want to share with everyone some photos I took and that my husband took of the poets in the Poetry pavilion. 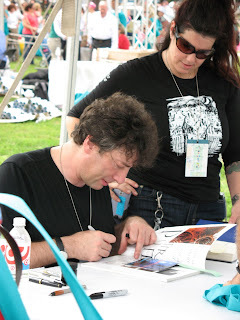 We also got a chance to take photos of Neil Gaiman and Tiki Barber as they signed books for other patrons of the festival. I thought I would share them since I’m sure they have fans out there. 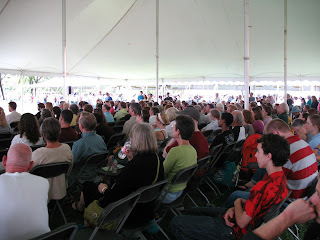 First, here’s a look at the abundant crowd in the poetry tent; it wasn’t as full as some of the other tents, but this signifies that interest in poetry is not dead. The first poet we caught up with–since I missed the Poetry Out Loud segment–was the new U.S. 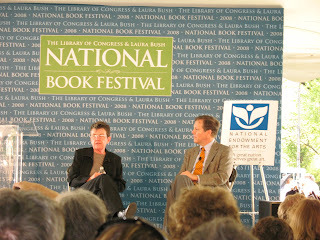 Poet Laureate Kay Ryan, though her term in that office actually doesn’t start until Oct. 1. 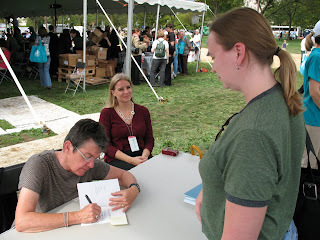 I’ll share with you two pictures, one of her being interviewed and one of her signing my book, The Niagara River. It was good to meet a fellow poet who is not into all the hoopla of becoming a top creative writing professor and who is more interested in just writing poetry and possibly improving the literacy of our country. 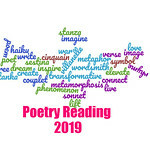 Traditionally, poet laureates have hailed from Ivy League schools and have careers teaching creative writing graduate degrees, but Ryan teaches at a community college and is engaged in improving literacy. She even commented about how her being an outsider may have helped her become Poet Laureate because there is a “romanticized” notion of the outsider in the United States. Moreover, she talked about how she came to poetry later on as a student and never believed herself to be a writer until a cross-country biking trip. In Colorado, she saw the Rockies and answered the question: Do you enjoy writing? And her answer was yes. She writes poems that are available to the reader in spite of their double meanings, allowing readers to see not only a surface meaning, but a deeper, emotional meaning as well. She is also a fan of Emily Dickinson, though she came to her through reverse psychology thanks to one of her teachers. Dickinson is one of my favorite poets as well. A great many of her poems are short because she likes them that way. But she says that while they are small on the outside, there is much more beneath the surface. I found her to be witty and engaging, and I look forward to her tenure as U.S. Poet Laureate, though she does not have any specific plans in mind other than touting the need for 100 percent in funding for public libraries and their branches so that they can be open 7 days per week and longer hours. One of the next poets we listened to was Eavan Boland who is from Ireland, though she lives in California and teaches at Stanford University. She focuses a great deal of her poetry on the differences between history and the past, where history is the recorded events and the past is something deeper and more nuanced. One of the poems she read, “Quarantine,” examined Ireland in 1847 at the time of the famine, but it also discussed the deep love between a man and his wife who died during the famine. Even with his last breath he held his wife’s feet to warm them with the remaining body heat he had. Many of the poems she read discussed Ireland at the time of the famine and the nuanced past of that time period. She was equally engaging. I just may have to pick up one of her volumes for review. Molly Peacock reminded me of school teachers I had in high school because she was approachable and ready to answer your questions. 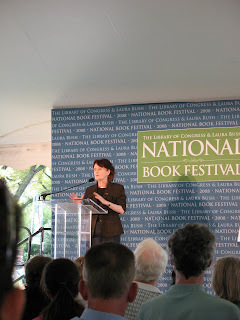 She read quite a few poems and engaged the audience with her wit. Another poet I should probably add to my TBR pile. I have quite a few photos of her speaking and answering questions, but I think this photo is the most dignified. She’s an expressive poet and very animated. Her eyes grow wide and her lips will form a nice round O in many cases, but I don’t think those would make for very flattering pictures. The final poet we heard before we headed back home was Michael Lind, whom the moderator called a man of letters, which I presume means he is well educated, one quite a few awards, and has accomplished a great deal in his given profession. In this case, he has been a columnist, a novelist, and a poet. I purchased his book, Parallel Lives, at the festival because the lines in his poems caught my attention, though he is a very sedate reader compared to the other poets we heard. I would almost say that I prefer to read his verse on paper than to hear him speak. I do enjoy his verse because it often does touch upon recent events that may be forgotten as the next horrific or phenomenal effort takes its place in the media headlines. Finally, here is Neil Gaiman—I had to keep you fans reading somehow–the book sale tent only had a limited number of his latest book, which is not even out in stores yet. Those books went fast, and his line was extensive. I’m not sure that everyone got to meet him or get their book signed. But the lines were moving fast, so you never know. He is not at all what I pictured. 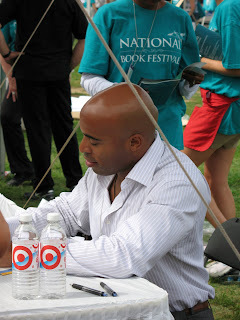 As for Tiki Barber, who is a former New York Giants football player and wrote a children’s book, his line was longer. However, I am quite sure that some of the people in his line were having NFL memorabilia signed and not necessarily his book. I know that a ton of kids and parents were lined up alongside him as I was taking his photo. We just wanted a close up shot of him since we had nothing for him to sign. Overall, you can see I really did not spend much time outside of the Poetry Pavilion. I did that for two reasons, one I was pressed for time and the Poetry Pavilion was the furthest one and two I love poetry! 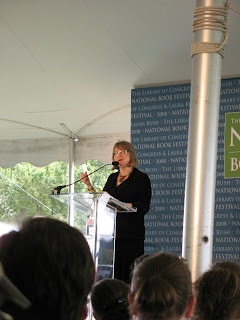 I was surprised by the number of people in the audience at the Poetry Pavilion, but I also was pleased by the turnout. The Poetry Pavilion was co-sponsored by the National Endowment for the Arts and many of their personnel introduced the poets scheduled to read and they had a table full of reading guides for not only famous poets and writers, but also information about Poetry Out Loud. 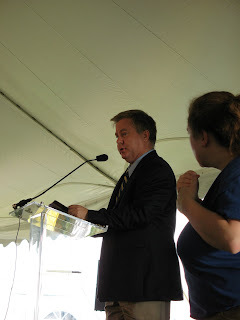 I was equally pleased that the hearing impaired could enjoy the poems as well with the help of sign language experts. 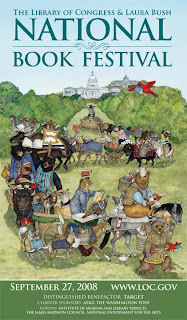 I would love to hear from anyone else who attended the festival and what events and authors they saw and what they thought. I think it would be great to hear about the other Pavilions’ events as well. Feel like sharing, leave a comment.